New Orleans legendary Voodoo Queen, Marie Laveau, was a very powerful women. It is said she could fix court cases, persuade police, that her gris gris bags were sold for thousands of dollars and that she had 12,000 devotees of every color. She was a healer, a magician, a saint, and a snake handler. To this day, if you visit her grave in New Orleans, bring her an offering, draw 3 X's on her tomb and knock 3 times, your request will be answered. Born in 1792, Marie transformed Voodou from a persecuted cult to an organized, respected religion and cultural tradition. She has achieved unofficial saint status and continues to perform miracles and answer prayers from her grave at New Orleans' St. Louis Cemetery # 1. 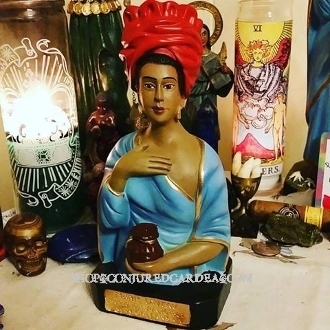 Each set comes with an authentic plaster statue from New Orleans, my own Marie Laveau Sacred Image oil, a purple conjure candle and a Marie Laveau Prayer Card.